The e-mail sent at the end of today best describes what can only be described as a traumatic nights (non) sleep and my physical condition early in the day so I won’t go on about it here. Breakfast had the potential to be a bit of disaster as the proprietor was so unorganised but things turned out just fine. He told us he had been trying late into the previous evening to procure the services of someone at short notice to cook for the 6 of us. The lad was really young but very capable and food started appearing infront of us almost immediately after we’d ordered. He didn’t have an idea what was stored in the giant American fridge/freezer but he did a sterling job at keeping the table well stocked. After the previous days (almost) marathon we were relieved to see we only had 14 miles to walk today. 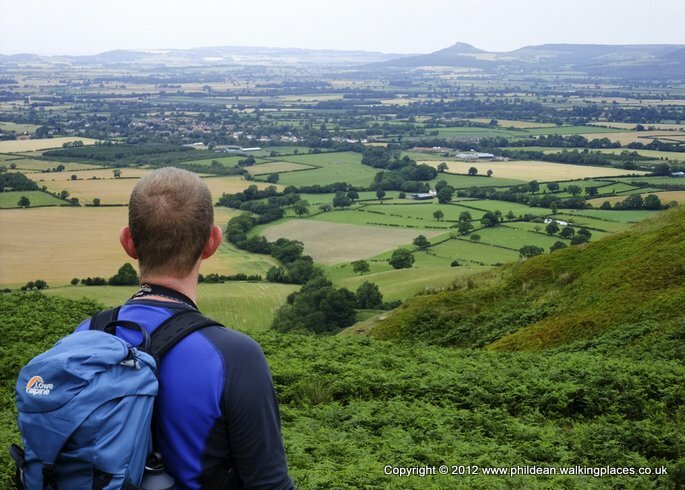 Some people choose to walk the full 23 miles to Blakey Ridge in one slog as there is no accommodation at the lesser more manageable distances. However Nige and I plugged for the more popular choice of splitting this section into 2. 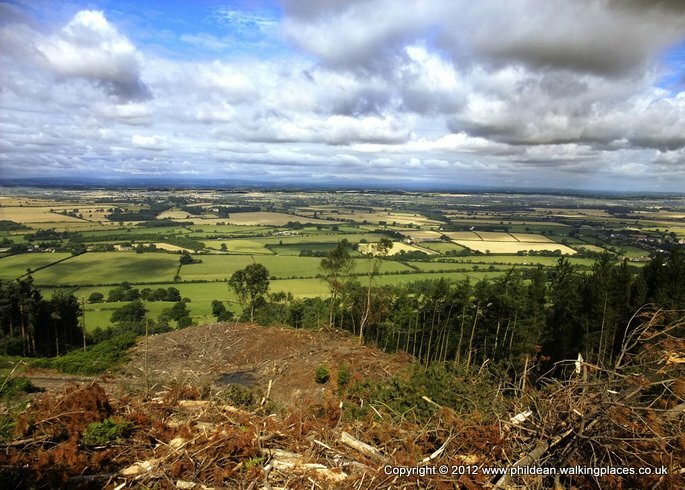 We would walk the 14 miles to Clay Bank Top then drop off the route into the nearby village of Chop Gate. This involved being picked up off the ridge at a pre-arranged place by our hosts for the night. 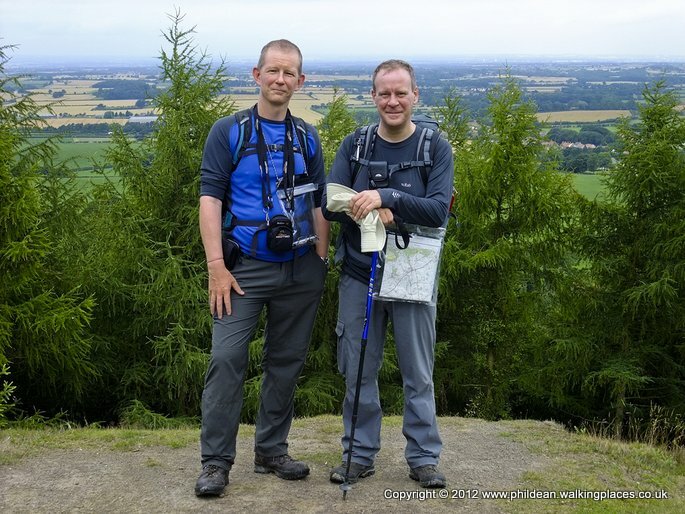 Today we would be walking in our third National Park, the Yorkshire Moors and most of the route was along the Cleveland Way which the guidebook stated would need little or no navigational skills. We set off at 7.57am (that was the time on the first photo of the day passing Ingleby Cross) and very tentatively tried to get our legs working. I was having real difficulty walking on flat ground. Incline or decline were fine strangely enough and I found myself praying for climbs or drops. 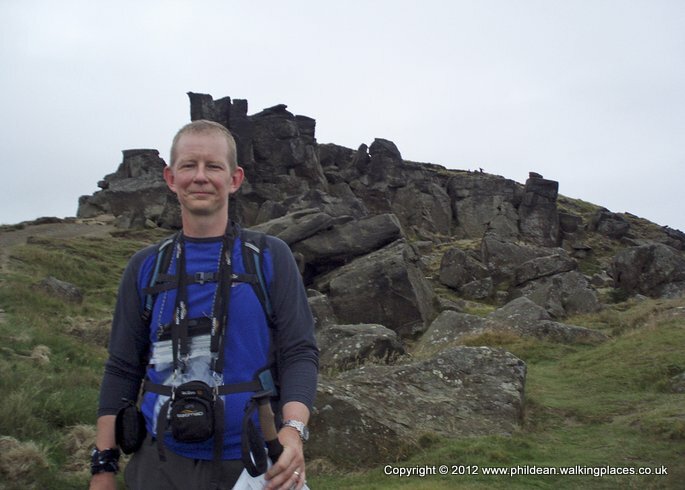 We approached Arncliffe Wood and caught up with Merv and Sue. At a hairpin bend it wasn’t clear which was the correct direction to take as lots of new paths seemed to have sprung up to as part of the current deforestation. I calmed nerves by getting the precious out of it’s case and told everyone to rest assured it would take us in the right direction even under the cover of dense tree coverage. Half an hour later after slogging through woodland that was getting more dense with every step I had to swallow my pride and admit we had gone the wrong way. They were very good about it and just laughed it off. I don’t know if I’d have been so forgiving. The path we wanted ran parallel to the way we’d been going but at a higher level and led to a satellite station where we let Merv and Sue go on. They still rib me to this day about my ‘gps moment(s)’ but I just remind them that no other coast to coast walker has seen some of the views I have. 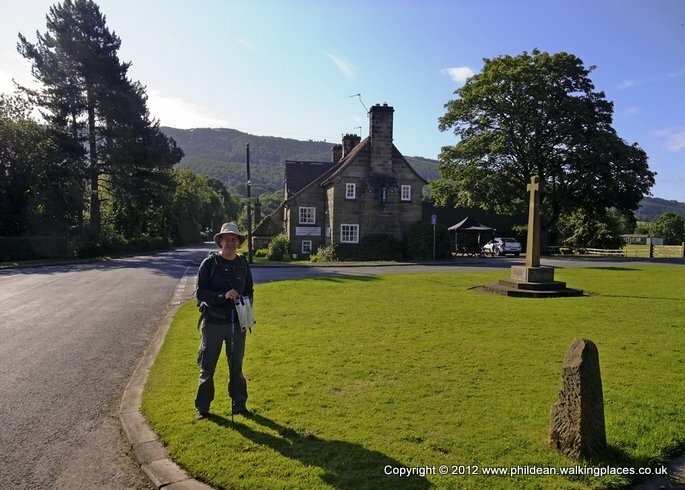 After gaining our composure we carried on along the Lyke Wake walk crossing through Scarth Wood and Clain Wood to pass through the totally forgettable Huthwaite Green. Two moors stood ahead of us, Live Moor and Carlton Moor but the path made for easy walking and we soon ate up the miles. 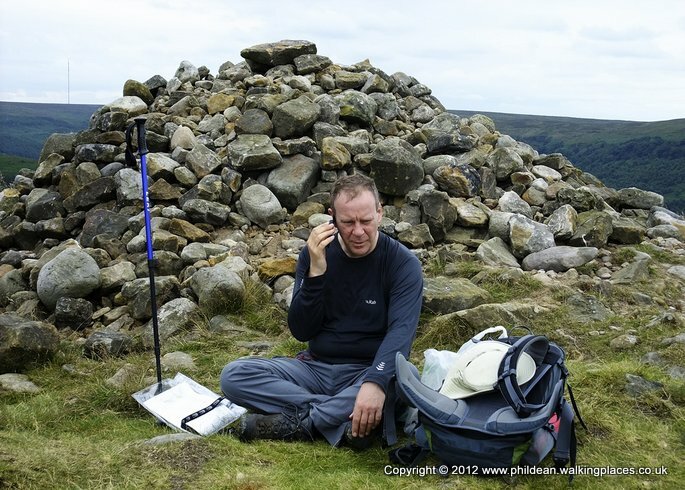 We stopped at a large cairn for something to eat and make a couple of phone calls whilst we still had a signal. All the while the view over the plains to our left were spectacular, putting into perspective the amount of ground we had covered the previous day. We made a quick phone call to our hosts for the night at the farm we were staying at in chop gate and agreed to meet them at 4pm on the road where the route dropped down at Clay Bank Top. 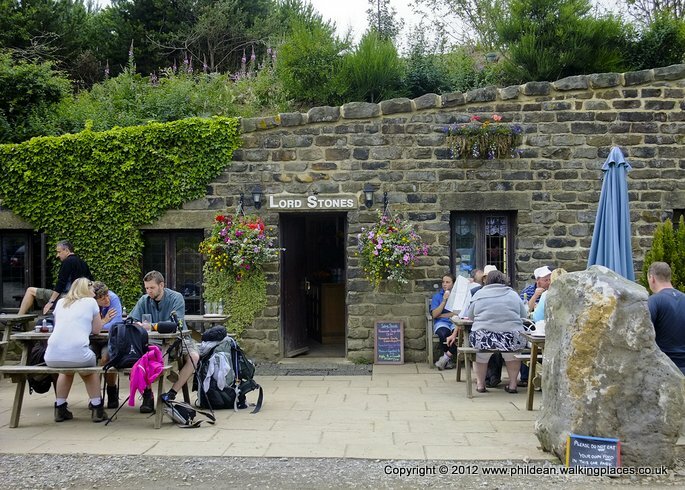 We knew we had plenty of time so on arrival at the infamous Lord Stones café we decided to take a good half our break over a mug of tea and a scone. It was weird to be in a place so isolated from the hustle bustle of everyday life and yet know most of those, if only by sight, sat eating and drinking. We chatted to a couple of girls we’d met earlier in the week then decided that long breaks really weren’t for us and set off up the steep climb back to the ridge. The scones had done more damage than we could have imagined and both of us struggled to reach the memorial seat at the top of Kirby Bank on Cringle Moor. The views were fantastic but the sound of gasping and wheezing somewhat spoilt the moment. From here on the path rose and fell steeply a number of times but with a deadline to keep we ploughed on until reaching the split in the path to Great Broughton. Ahead was one of the final climbs, up to the Wain Stones. Half way up the prolonged and steep ascent we looked back to see Merv and Sue at the split in the path. They stood there for ages looking at their map as if deciding which way to go but finally they took the offshoot into the woods and towards the village. Nige reckoned they were standing still for so long because they’d spotted us ahead and didn’t wish to catch up and be subjected to my gps bloomers but I reckon they had digs in Great Broughton. We approached the Wain Stones which needed a bit of careful navigation and were relieved to see that the path ahead was not only paved but, for the first time in hours, flat. Our timing was perfect and the lift arrived about 10 minutes after we did. We were whisked off to a smart farm down a narrow lane and shown to our room. 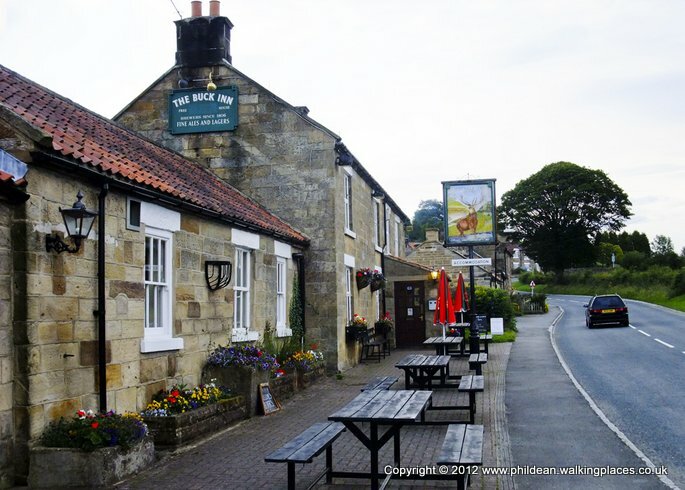 The proprietor told us that phone signals were virtually impossible here so we agreed a time to be picked up from the Buck Inn after we’d eaten and watered. 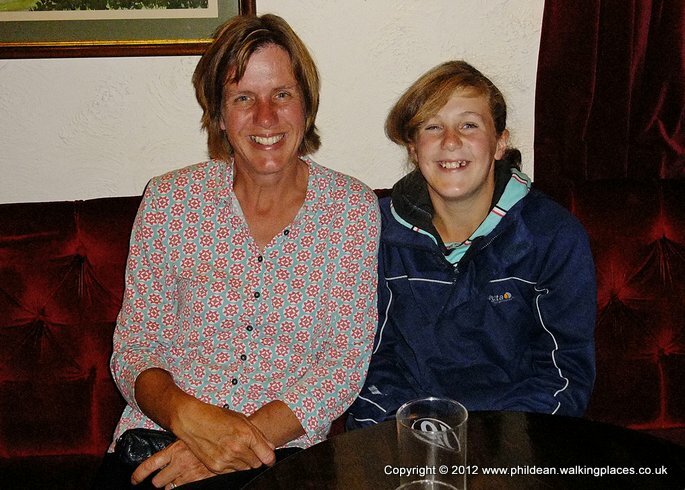 We sat with a lady we’d met several times who was walking the Coast to Coast with her 12 year old daughter. Not only did she impress me that she could walk the walk (very easily according to her mother – and in trainers!) but also kept her Manchester City scarf on when eating her pie and chips. For some reason we hit the single malts quite hard and this may have been the reason for mild hysterics once we got back in our room. Not helped by the fact that it was next to the shared bathroom we acted fairly childishly until the usual pattern kicked in of us lying wide-eyed and fully awake into the early hours of the morning. Ow ow - agony ! Got up in the night at 3am after obligatory 4 hours sleep to get a drink of water and ear plugs as Niges’ snoring was so loud it was drowning out the sound of the trucks thundering past on the A19, and found out that somehow, during my time in bed, my feet had turned into swollen misshapen lumps of meat with hot pokers in the heels which dug in deeper with every stuttering step. Also, prickly heat from wearing thick socks and gators meant that from the knees down I was in a bit of a mess. 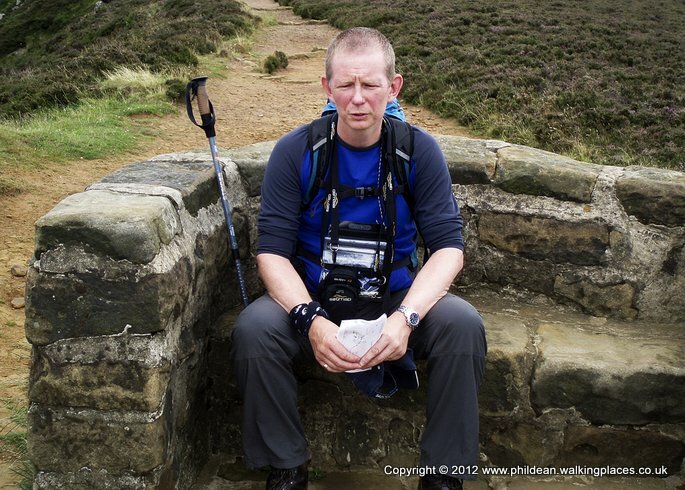 I was genuinely worried about the following days 14 miles (very hilly). I stuffed the ear plugs in as deep as possible and lay awake until the alarm went off at 6.30am. Now proficient in the art of bandaging feet because of his own predicament, Nige helped me bandage mine wih moleskin plasters and compeed strips but even so, the other guests stared as I shuffled into breakfast with a fixed smile. The b & b was poorly run by a bloke whose girlfriend had just left him – she had obviously been the driving force behind the business. Glad to get started on the walk but soon realised I had a real problem walking on flat ground – fine going up and fine going down but going flat I looked like someone ice-skating for the first time where you slide one foot in front of the other without lifting them up. Maybe this was the reason I missed the first major turn in the forest and led 2 innocent people, stupid enough to follow us, along a track for almost a mile before it came to a dead end ! Today we walked on the Cleveland way path and it couldn’t have been more of a contrast than yesterdays walk – up and down non-stop , just perfect for my feet. Spectacular views over to Middlesborough and Stockton were spoilt only by the constant flow of sweat and sun cream which flowed into my eyes. Today’s instructions were a bit complicated as there is no accommodation on this part of the coast to coast path so people have to get to a certain point where a road crosses the moors, ring their accommodation and ask them to pick them up. Luckily, all went smoothly and 10 minutes after the call a nice bloke pulled up and took us to a farm in chop gate. Off to the pub in 5 minutes to up the beer count to 52 pints and 12 whiskeys.